Stir to Action Tea is a lovely everyday tea which is good to you, the local community, the environment and the people who produce it. It was created at Stir To Action’s Ethical Tea Tasting and Blending workshop in Bridport, Dorset in February 2015. A blend of organic, fair-trade Ceylon Tea and an Assam tea from the Mangalam Estate blended and packaged by Chai Wallah Tea Co. The Ceylon tea comes from the Greenfield Estate, which has been registered as organic since 1992 and ensures the welfare of the local community through a number of projects including access to medical care, education and training opportunities to diversify their income. The Estate also works to improve the local environment, for example through the Bingiriya Temple Project, a Bhuddist temple that protects virgin jungle and it’s fauna and flora. Co-operatives have been developed for the production and supply of products such as milk. The Assam Mangalam tea producers do not use child labour (common on some tea estates) and provides free housing, fuel and water for their employees along with subsidised healthcare and education. 5% of the profits goes towards bursaries for other workshops in the series, so when you buy a pack of our tea you’re supporting workshop trainings for the new economy! 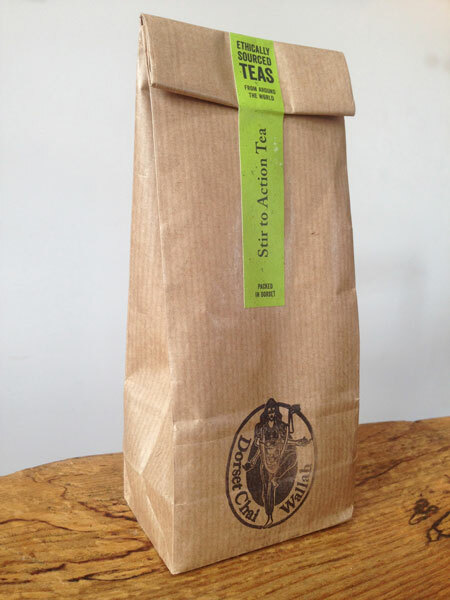 Purchase our Stir to Action Tea blend in our shop.